I’ve enjoyed drinking wine for many years. It wasn’t until I was in my mid-30s, though, that I began to consider the texture of wines. Since that time, I’m as drawn to the texture of certain wines as I am to their flavors and aromatics. I’ve also taken to thinking quite a bit about a wine’s structure and its length. I guess as I get older, I’ve really come to think of wines sculpturally or architecturally. For me, the best wines have a significant presence about them, and that presence can inspire associative aesthetic musings; it can assume shapes, colors, and memories in the mind of the imbiber. R.H. Drexel: Can you talk to me a little bit about why you chose an owl to represent the Saintsbury Pinot Noir from Sundawg Ridge? Tim Colla: The first morning I sampled Sundawg Ridge in 2013, I was crossing the threshold between the north and south facing blocks when I looked up to see a Great Horned Owl perched, wings spread, on a branch. I couldn’t have been more than ten feet below the bird, and it was a magnificent display of weight, proportion, and vitality. The bird was simply stretching its wings, but it was hard not to be awestruck – a glimpse of its power and size, before weaving its wings back around itself. The forest surrounding the vineyard is alive and vital, and the former riverbed offers a pathway for the surrounding wild inhabitants to travel through the heart of the place. It is a vineyard site very much intertwined with its surroundings, which makes it harder to read, farm and make resulting decisions, but without a doubt helps in creating a special wine. RHD: Let’s talk about how you started sculpting in ice and about your mentor, Takeo Okamoto. TC: Between the summer of my junior and senior years of college (where I was studying chemistry and fine art) I found an “ice mover” position on Craigslist. The job listing basically required that I was comfortable traveling to Queens, and that I was comfortable working with 300-lb. blocks of melting water. 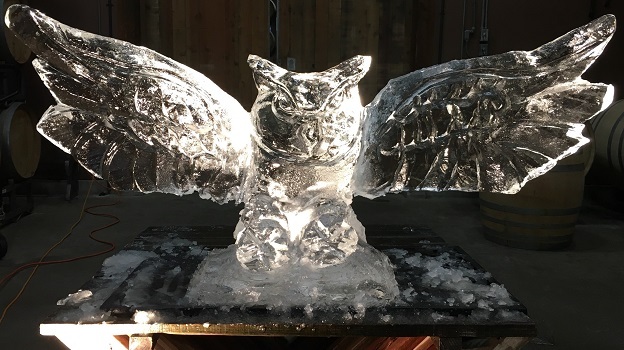 They called me in for an interview, and I fell immediately in love with the owners of the ice sculpture studio, Takeo and Shintaro Okamoto. It was a classic mentor position in which I did whatever was asked, and little by little, Takeo would teach me how to carve ice when the time allowed. 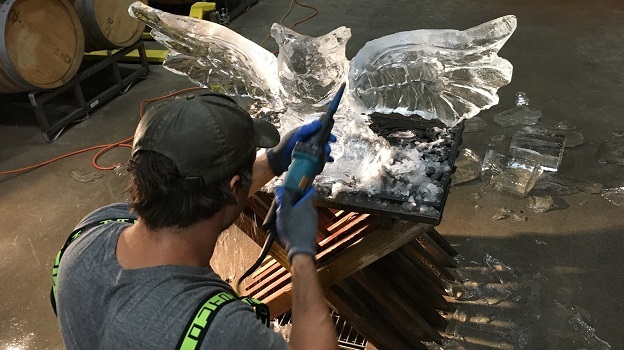 By the end of the summer I was hired on as a sculptor, and spent the weekends of my senior year of college carving ice. When I graduated, I stepped into a full time sculpting position, and six months later was promoted to chief sculptor/studio manager. We employed six full time chainsaw-wielding carvers. Complete mayhem, but profoundly fun. I was surrounded by such talented and good people. 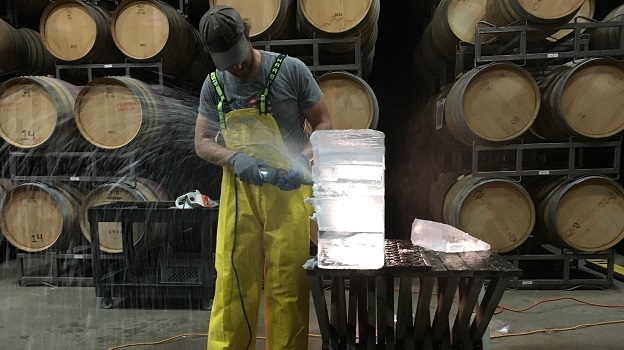 It is obvious to say that, much like winemaking, it was process-oriented work and was remarkably satisfying. 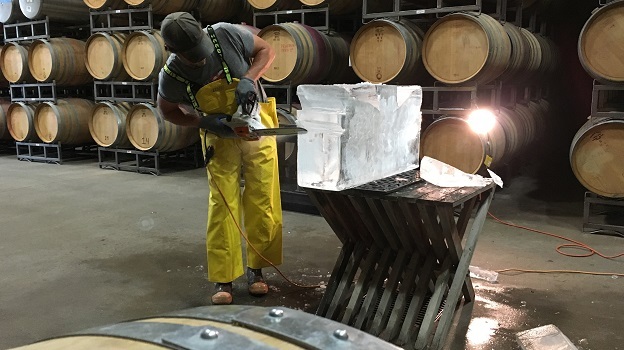 RHD: When you’re making a wine, are you thinking about it sculpturally at all? TC: Great wines are, without a doubt, designed. 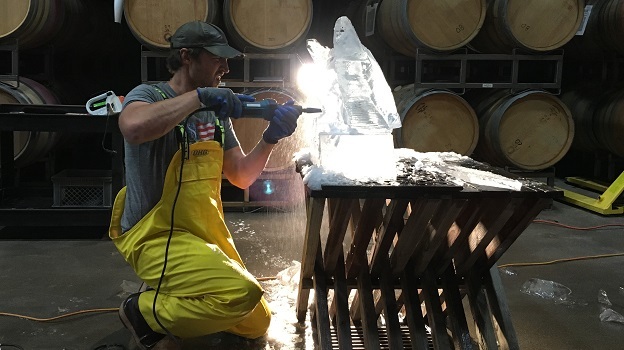 As winemakers, we must make key decisions that clearly define and build the type of wine we want: how the grapes are farmed, when the grapes are picked, how the fruit is fermented, how it macerates, what the wine ages in, how long it ages, etc. All of these decisions are unavoidable, and each decision shapes and defines the final product. We strive to make wines that are both generous and vibrant, structured and round. To do this, we need building blocks that combine to give these sensations. We cannot throw everything into a tank, treat it all the same, and expect the result to be our ideal expression of a site or place. RHD: The first time I tasted your Sundawg Ridge Pinot, I was really charmed by its length. 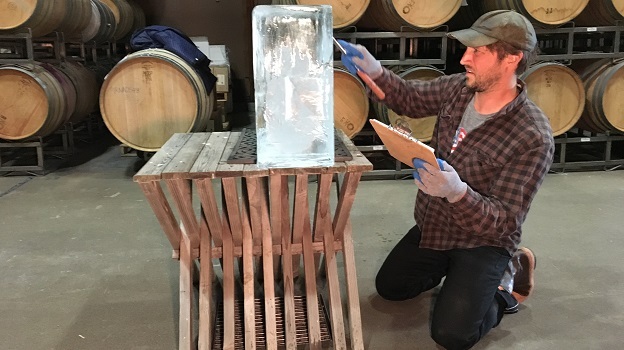 When you’re making a wine, are you consciously thinking about its length? TC: We often talk about the “energetic” nature of a wine, or how the wine performs and evolves when exposed to air and food – and good company. Length and energy go hand in hand. I think they are the result of picking grapes at their optimal ripeness, a thoughtful and thorough extraction, and bottling the wines when they are still vibrant and fresh. Finding that “sweet spot” is of course subjective, and there are certainly many interpretations of that place. Capturing the vitality of the vintage and place is the goal. The 2013 vintage was our first experience with Sundawg Ridge, and we would be lying to say we knew exactly what to do. The three clones planted expressed themselves very differently there, so it gave us a lot to work with when we were blending. RHD: The Sonoma Coast is quite sprawling, so much so that I've found it easier to write about designates, rather than to try to write about the entire AVA. What is particularly special about the Sundawg site? TC: Sundawg has a lot packed into a very small footprint. With less than seven acres of planted vines, the north- and south-facing aspects provide diverse topography and exposure. Even within the single blocks there are swales, shading, and changing soil types and depths that affect continuity in ripening the fruit. Because the hillside blocks are small, the variation within each block is minimized, but for the most part we embrace the wider spectrum of flavor and phenolic ripeness in this vineyard, and have come to appreciate it as a certain complexity to the site. Sometimes vineyards just add up. When the synergy of the inherent qualities of a site combine with clonal diversity and good farming, the results are often compelling. 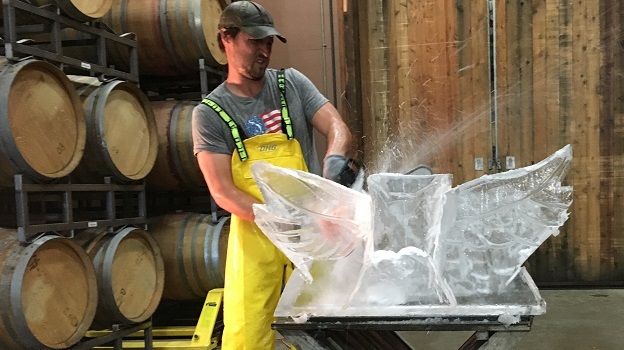 A couple of weeks after my interview with Tim, I opened a bottle of the 2013 Saintsbury Sundawg Ridge Vineyard Pinot Noir and enjoyed a couple of glasses while looking at photos of Tim’s sculpture. In a quite literal sense, I can identify aesthetic threads between the owl and this wine. The suggested movement of that generous wing span is mirrored by the energetic aromatic lift of this wine. It is fragrant just sitting in the glass on the table, without even being swirled in the glass. The cuts in ice that suggest plumage remind me of its light, feather-like texture. 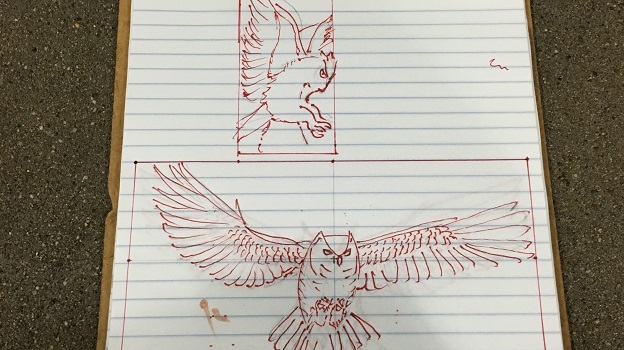 The obvious raptor strength of the owl is, for me, suggested by an almost unrelentingly long finish. What I like most, though, is thinking about it less literally. At its very essence, this wine was rendered with a light human touch. The use of oak and extraction is modest and deliberate. Unquestionably, the Sundawg Ridge site announces itself in the glass, and that’s what I find most inspiring of all. Tim didn’t choose to sculpt some abstract form in the hope of illustrating his “approach” or “style” with regard to this Pinot Noir. Instead, he chose a memory imbued with and delivered by the natural world. I look at Tim’s photo, I sip the Sundawg Ridge and, for an evening at least, the cares of the daily world melt away.